with ESO in the European Parliament in May. This autumn we released a lay version of the Stroke Action Plan with the scientific version being published in the European Journal of Stroke in October. SAFE now has 33 member organisations for the first time in our history, and happily approximately 10 now employ staff, a sure sign of increasing professionalism. We would like to express our grateful thanks to Bayer for supporting the working conference and the development of the Stroke Support Organisation Faculty Tool (SSOFT). Victoria Brewer has managed this huge project with great professionalism and we are thrilled to now have an educational and training tool to drive forward advocacy and the growth of stroke support organisations. Its success will, I believe, be measured by the number of countries impacted by the cadre of people mobilised by the tool. They will be enabled to advocate and campaign, build stroke support organisations and improve stroke care and support. We would also like to thank the BMS/Pfizer Alliance for their additional support for the 2018 working conference. This year we have again contracted Weber Shandwick to support our work within the EU. Through this collaboration we have continued to raise the profile of stroke within the European Parliament, and have initiated contact with the forthcoming Romanian Presidency and the Committee of the Regions. (The European Committee of the Regions (CoR) is the voice of regions and cities in the European Union (EU). It represents local and regional authorities across the European Union and advises on new laws that have an impact on regions and cities, which is 70% of all EU legislation). We held successful regional conferences in June and July, in which member organisations had the opportunity to meet and discuss issues, challenges and progress. These covered all countries in Europe, and we are grateful for the support of Boehringer Ingelheim whose sponsorship enables these events to occur. Alongside the working conference, the regional conferences have been of critical importance in enabling the setup and development of stroke support organisations. We have delivered more stroke messaging to the public than ever before, and our presence on social media grows day by day. Jelena Misita, SAFE’s Communications Manager, has done an outstanding job, as well as managing our work around stroke awareness, including sitting on the World Stroke Campaign working group, our website, and our creation and print work, of reports and literature, Jelena handles many meetings with outside partners. This includes for example the work with the Angels project involving thousands of leaflets in 13 different languages being produced and distributed. Our industry partners group, where commercial organisations get together with us to discuss how we can help move the agenda of stroke prevention, care and survivor support forward, has gone from strength to strength. I want to thank in particular all those individuals and their organisations who have played such a key role in enabling SAFE to perform and achieve at the highest level yet. Their contributions are very much appreciated, and absolutely essential for SAFE sustainability. We are once again holding our working conference with an important national organisation, the German Stroke Foundation. This organisation deserves the highest praise for its continued support of SAFE, an involvement that stretches back to the earliest formation of our coalition. 2018 has been our busiest year to date, with ongoing and new projects such as Merz’s spasticity website, the website on Prevention sponsored by Amgen, being developed and providing much needed information on the web. Our Volunteer Gary Randall deserves our thanks for his support with regard to our contract with Oxford University to deliver a research report on the economic impact of stroke to be launched October 2019, and in managing a raft of EU research projects. The SAFE board has worked harder than ever this year, and I as President would like to commend and thank them all for what they have given to help conquer stroke. We have made changes to our governance to ensure that we are able to manage an ever-growing coalition and range of financial and other obligations. I would also like to particularly single out Sandra Jackson, who moved into a full time role with SAFE this year to provide the Secretariat, necessary given the growth of SAFE. Sandra as a consequence has been able to address some of our longstanding issues with regard to the installation of a management accounting system enabling us to better ensure the sustainability of SAFE into the future. Additionally Sandra has continued to ensure, with the Treasurer Grethe Lunde, effective cost control to ensure our money goes as far as it can to conquer stroke. 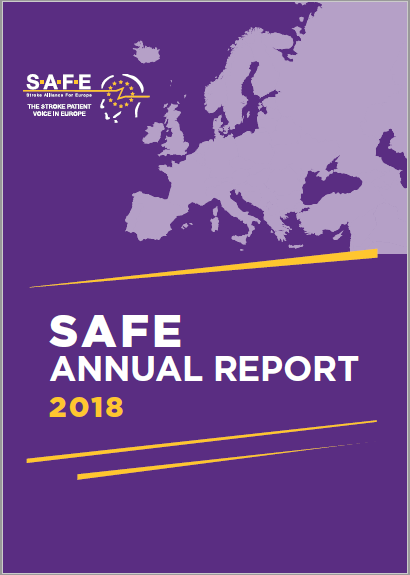 As the central activity of SAFE has raised its performance, so too we see more member organisations beginning to grow and employ staff, conduct campaigns, run services, and build their websites and social media activity.